As evidence by the pumpkins in the background it was Halloween time in Patchogue. From the August 04, 1966 issue of the Long Island Advance talks about the Drivers and Mechanics of Ultility Lines going on Strike. The 60's saw alot of strikes by the TWU 252 in Suffolk, though the others were by the School Bus division. Here is a photo I found for sale on Ebay of the above added Hempstead Bus Corp #228. From my very limited knowledge I assume #228 is a Ford Transit. 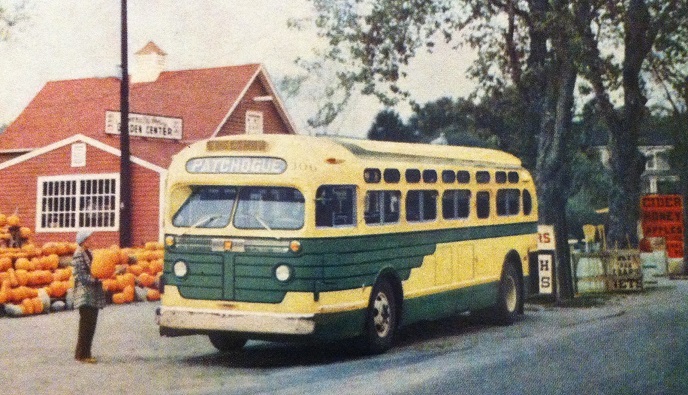 Also found for sale a photo of Rockville Centre Bus Corp #104. I found this photo of a Mack #61 for whats said to be Rockville Centre Bus Lines. I'm not sure how this fits in. Here is one of Bee Line Inc #140. Here is a photo of the above added Long Island Bus Co Inc Flexible New Look for sale on EBay.